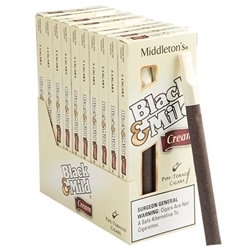 Black & Mild Cream Cigars are a popular plastic tip cigars brand created with Middleton's pipe tobacco allowing for a smooth and mild smoke. Each cigar is infused with premium light Cavendish and Kentucky Burley with the essence of warm sweet cream. The experience of smoking Black & Mild’s is a unique pleasure, worthy of anyone who already enjoys these cigars. Available here at Smokers Discounts!